Before there was “This is your brain on drugs,” there was a little novel by Bret Easton Ellis more jarring than any image of eggs sizzling in a frying pan. In Less Than Zero, Ellis’s 1985 debut, Clay, a richie-rich from Los Angeles has returned to his hometown during winter break from his East Coast university. Nothing has been touched in his bedroom since he left four months ago, right down to the Elvis Costello poster on the wall; His posse of trust-funders, male models, and drug dealers is still running fast and loose. Clay and his old girlfriend Blair are re-defining “It’s complicated,” and his best friend Julian is MIA. Clay caroms from party to party to restaurant, snorting this, drinking that, swimming laps in the family pool, verbally sparring with his teen-aged sisters who are indistinguishable from each other. Tumbling into bed with sometimes Blair, and sometimes boys. Every day is a lot like the previous day, and Clay moves numbly from encounter to encounter. Things become increasingly grim, cheap thrills become more expensive, and it takes more and more and more to keep these kids entertained. A twelve-year-old girl is gang raped, and a dead body found in an alley is whimsically accessorized with a cigarette, but no one calls for help. Meanwhile, Julian is dropping trou for closeted business men to pay off his increasing drug debt. Ellis’s novel is written in a detached, unemotional way that really speaks to the cultural boredom of fast-living LA teens in the mid-1980s. And where the movie is a gigantic “Say Nope to Dope” campaign, this is more of a grim show-don’t-tell. The only thing better than this book is that Bret Easton Ellis is revisiting Clay in his upcoming novel Imperial Bedrooms, which comes out in June. I saw Ellis give a reading at the UofM back in 2005. 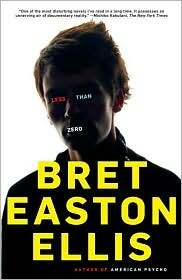 He said that Less Than Zero was his least favorite movie adaptation. I’d have to agree. They [the book and the movie] are two separate things that just happen to share a name. This is a good book… haunting and desolate, but good. I hope Imperial Bedrooms is just as good.